We are continuing our discussion on patent costs from yesterday. If you missed yesterday's posting, read it here. Attempting to determine whether the Government has a license or right to a free use of a particular patent is often times difficult and there are frequent disputes between the Government and patent holders as to the Government's rights. The Government is usually aggressive in asserting its rights, especially when it feels that it has already contributed to the value of the patent. Auditors are often concerned about the costs of royalties when there is not an arms-length transaction involved. They are especially attuned to royalties paid to persons, including corporations, affiliated with the contractor, paid to unaffiliated parties, including corporations, under an agreement entered into in contemplation that a Government contract would be awarded, and paid under an agreement entered into after the contract award. In cases where a patent was formerly owned by the contractor, the royalty amount allowed cannot exceed the cost which would have been allowed had the contractor retained title. Acquiring records to support the costs that would have been allowed is usually problematic for contractors. The auditor's going-in position is usually zero dollars. The Patent cost principle (FAR 31.205-30) should be considered in conjunction with the cost principle on royalties and other costs for use of patents (FAR 31.205-37). FAR 31.205-30 deals with costs associated with filing and prosecuting a patent while 15.205-37 covers the cost of acquiring or using existing patents. Today we will be discussing the -30 clause and tomorrow we will pick up the -37 clause. Patent costs are also briefly discussed in FAR 31.205-47 and we will cover that restriction as well. The first thing that contractors should be aware of is that patent costs, except for general counseling services discussed later, are only allowable when they are incurred as a requirement of a Government contract. This does not necessarily mean that such patents must be specifically called out for in the contract if one can establish by other means that the patent is necessary to perform the contract. Sometimes this can be a very difficult task. 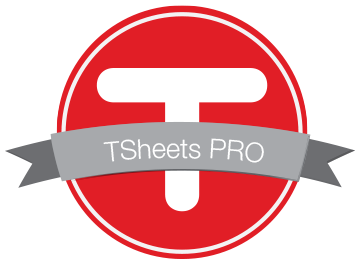 Costs of preparing invention disclosures, reports, and other documents. Other costs in connection with the filing and prosecution of a United States patent application where title or royalty-free license is to be conveyed to the Government. General Counseling Services. General counseling services, even when not required by the contract, may be allowable. General counseling services are those relating to patent matters, such as advice on patent laws, regulations, clauses, and employee agreements. Other than those for general counseling services, patent costs not required by the contract are unallowable. Many disputes arise as to whether legal costs are general in nature and are comprised of the tasks listed in the definition (e.g. advice on patent laws, regulations, clauses, and employee agreements). Contractors claiming such costs must be prepared to provide attorney work products to support the allowability. The interim rule (from July 2010) requiring certain contractors and first-tier subcontractors to report executive compensation, was finalized yesterday. Nothing substantial changed from the interim rule. Contractors and first-tier subcontractors who receive more than 80 percent of their funding from federal sources and where those revenues exceed $25 million must report the compensation paid to the five highest paid executives in the company. Compensation, in the context of this new rule, includes not only salaries but also bonuses, stock, stock options, stock appreciation rights, earnings for services under non-equity incentive plans, changes in pension values, and above-market earnings on deferred compensation. The final rule included many public comments and responses. Most of these offered up sound arguments as to why this information should not be collected and made available to the public. The FAR Counsel's answer was always the same; "The public disclosure of executive compensation information implemented under this rule is a statutory requirement." In other words, if you want to the requirement to go away, go see your elected officials. The new DFARS business system rules that became effective last February apply to CAS covered contracts. There was a collective sigh of relief from non-CAS covered contractors when this threshold was announced. However these rules will apply to more contractors than did the old rules. The new business system rules covering the accounting, estimating, purchasing, EVMS, MMAS, and property management essentially replace DCAA's old ICAPS (Internal Control Assessment Planning System). The ICAPS were performed at contractors with revenues from flexibly priced (e.g. CPFF, CPIF, CPAF, FPI, and T&M) contracts exceeding $100 million. That $100 million ICAPS threshold has now dropped to $50 million and now includes fixed price contracts in addition to all of the contract types listed above. That lower threshold and the expanded base of contracts will subject many more contractors to rigorous internal control requirements than before. We should caution non-CAS covered contractors that even though they may not be subject to the new DFARS business system rules, these rules are now the standard for measuring whether contractor's systems are adequate for Government contracting purposes. DCAA and DCMA will use these rules to measure whether systems are adequate. The only difference is that non-CAS covered contractors will not be subject to withholdings on billings. Last week we reported on the Government's program to enhance its contractor integrity databases. The main problem with the information in the databases is the inability to link different operating segments that happen to fall under the same corporation. Thus there is the real possibility that the Government could award contracts to operating segments that are affiliated with segments that have been suspended or debarred. Such information could be relevant to responsibility determinations. DoD is getting a jump on things by proposing to amend the DFARS (DoD FAR Supplement) to provide a provision that any offeror, if owned or controlled by another business entity, must identify the CAGE code (Commercial and Government Entity code) and legal name of that business entity. This information, will, after time, allow the Government visibility into who really owns or controls the entity bidding on a particular contract. It should also help the Government in its responsibility determinations. There may be some implementation issues however. One issue that comes to mind is the term "owned and controlled" Under GAAP (generally accepted accounting procedures), "owned" and "controlled" have different meanings. Another issue that comes to mind involves joint ventures. Which of the partners are the owner? Which of the partners has the "controlling" interest. If you care to comment on this DoD proposal, instructions for doing so are contained in this announcement. Time and Materials contracts are agreements to provide specific labor skill levels at fixed negotiated rates (and materials at actual costs). The Government pays a fixed rate for each hour of labor provided by the contractor. Historically, auditors have limited their reviews to ascertaining whether the hours billed under the contract are traceable to timekeeping records. Recently we were alerted to an instance where the auditors took their analysis deeper and checked to see if the contractor employees who actually worked on the project, had the requisite skills and qualifications for the position being billed the Government. Where the qualifications did not meet the standards for the position, the auditor questioned the entire cost. It will be interesting to see how this issue is resolved. Although by all accounts the Government was pleased with the work performed by the under-qualified individuals, the Government was nevertheless overcharged for the level of skills delivered. Contractors with Time and Material contracts should self-assess any vulnerabilities in this area. 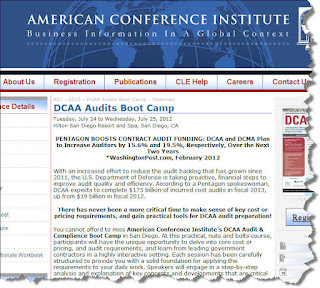 One type of audit that DCAA performs occasionally but gets little discussion is audits of contractor efficiency, effectiveness, and economy or commonly referred to as “operations audits”. The rationale for these audits lies with the presumption that by eliminating inefficiencies in operations and improving the effectiveness of programs and departments the Government contractor and therefore the Government will save money. These audits are typically performed at large contractor locations with significant percentage of flexibly priced contracts (e.g. CPFF, CPIF, T&M, etc). For contractors engaged primarily in commercial work and fixed price contracts, the “competitive influences” (profit motive) kick in and provide ample incentive to become as efficient as possible. Most of the time, these audits turn out to be duds. Contracting officer who have to adjudicate the audit results don’t like them and often dispose of them with prejudice. One reason is that auditors tend not to look at the larger picture when making recommendations. For example, one time, a Government auditor issued a report stating that the contractor could save a ton of facilities costs by letting their employees work from home. It didn’t matter that the contractor had already tried a work at home program but scrapped it for various reasons. And then there was the recommendation to save electricity by replacing existing lighting with more energy efficient lighting. In his analysis, the auditor did not consider the sunk costs or the cost of the remaining useful life of the current lighting. Had the contractor followed the auditor’s recommendation, it and the Government would have ended up spending more money than less. There have been a few notable exceptions to the dismal track record of operations audits. One auditor noticed that ship repair crews were spending a significant amount of time to use the land-based restroom facilities. The auditor calculated that the contractor could save significant labor hours by placing portable toilet facilities on the ship. The contractor agreed and everyone saved money. One auditor visiting a remote contractor facility witnessed that contractor employees were sleeping, playing ping pong and other games, reading newspapers, and taking very long lunches. Their first line supervisor was 35 miles away and rarely visited the remote site. The auditor recommended closer, more frequent supervision. The contractor agreed and ultimately was able to reduce the site staff by half while accomplishing the same amount of work. Auditors will sometimes attempt to impact forward pricing rates for the results of operations audits. It is important for contractors to know that without contracting officer concurrence and determination, such a position is unwarranted and inappropriate. A contractor submitted a proposal for real property construction and engineering services. The solicitation stated that bids would be evaluated for price realism and price reasonableness. When evaluating bids, the Air Force compared each bidders proposed labor rates by labor category to the average of all labor rates submitted by each offeror. Where the proposed rates deviated from the average by plus or minus ten percent, the Air Force notified the bidder(s). In notifying the bidders, the Air Force was not requiring them to revise their proposals. They were simply asking that the offeror(s) verify that the prices were what they intended to propose or make adjustments as necessary and provide revised prices. In this case, the Air Force notified the bidder that its rates in 14 categories were lower than the average and its rates in 3 categories were higher than the average. The bidder revised its proposal by increasing the 14 lower than average rates and lowering the 2 higher than average rates. The net affect of the changes increased the overall proposed price. The Air Force awarded contracts to the ten lowest bidders but this company was not among them. So, they protested, claiming that they were coerced into increasing their bid and moreover, the Government should not have been looking into that level of detail. They should have limited their review to bottom line only. The GAO denied the protest stating that the bidder was not compelled to revise its bid but was only alerted to the fact that its bid was outside the average. Bidders were also afforded the opportunity to revise their bids but not required to. The GAO also did not buy the "bottom line" argument as the Air Force was very clear in its solicitation as to the methodology it would use to evaluate proposals. The Government is soliciting public comment on how to improve contracting officers' access to relevant information about contractor business ethics. The Government implemented a database called FAPIIS (Federal Awardee Performance and Integrity Information System) back in 2010 to collect performance information. Contracting officers now routinely consider information contained in this database when making responsibility determinations prior to awarding contracts. Information in FAPIIS comes from different sources, including the CCR (Central Contractor Registration) and directly from contracting officers for past performance data, suspensions, debarment, termination for default, etc. to collect information about contractor performance. Government contractors submitting bids greater than $500 thousand having more than $10 million in active contracts must report criminal convictions, civil liability, and adverse administrative actions into CCR. The problem that contracting officers have been finding is in the unique identifiers that contractors use to identify themselves. Information in FAPIIS is organized by DUNS numbers (Data Universal Numbering System). However, the system, as it is currently constructed, requires contractors to maintain a unique DUNS for each physical location or different business address in an organization. The FAPIIS does not associate all DUNS numbers of a corporate entity. Thus, a contracting officer cannot determine if there may be relevant information reported under different DUNS numbers assigned to other locations at which the entity named on the contract conducts business or under different DUNS numbers assigned to other parts of the corporate entity that are not named on the contract, such as an affiliate or subsidiary, the share the same management, infrastructure, and systems as the entity uses in doing business with the Government. For information on how you can submit ideas for fixing this conundrum, click here. The Small Business Administration (SBA) recently released its small business procurement scorecard for fiscal year 2011. This scorecard measures government-wide performance in not only contracts awarded to small businesses but also subcontracts awarded by prime Government contractors so small business subcontractors. It gave the overall program results a "B". As you know, the Government established goals for small business procurement. Those goals have remained fairly constant over the years (although there is currently pending legislation to increase some of them). The goals are expressed as a percentage of procurement dollars: small businesses - 23%, women-owned small businesses - 5%, small disadvantaged businesses - 5%, service disabled veteran owned small business - 3%, and HUBZone - 3%. In fiscal year 2011, Government agencies awarded contracts worth $91.5 billion to small businesses equating to 21.65% of total procurement dollars. That figure did not meet the goal and is down from 22.66% in fiscal year 2010. The SBA report card also showed dips in all the other categories except service disabled veteran owned small businesses which went from 2.5% to 2.65%. The Government met its goal in only one category; small disadvantaged businesses. Prime contractor also have goals for awarding subcontracts to small businesses. These goals flow from contractual requirements and are the same as the Government goals except for one category. Generally speaking, prime contractors performed better than Government agencies in meeting their small business goals. SBA is not pleased with the trend line from fiscal year 2010 to 2011. Look for increased emphasis on small business contracting in the coming months. Yesterday we discussed the new OMB initiative that encourages prime contractors to expedite payments to their subcontractors who are also small businesses. Agencies are being directed to expedite payment to all contractors, both small and large from 30 to 15 days so that those contractors can do the same with their subcontractors. We've already gotten feedback from a couple of small businesses saying that their prime contractors do not want to implement required changes to their systems due to the limited duration on this initiative (one year). They're saying that the changes will be significant, costly, and time-consuming. We wonder what they're talking about. Unless contractors are small businesses, there is already an explicit requirement to pay subcontracts in 30 days (see FAR 52.216-7.b.). Any accounts receivable system (from Deltek down to QuickBooks) will allow you to enter various terms of payment, e.g. "net 30", :"net 15", etc. When a subcontractor invoice comes in, the accounts receivable person has to enter payment terms into the accounting/accounts receivable system. There is certainly no added effort to enter "net 15" as opposed to "net 30". If your a small business subcontractor experiencing "push back" from your prime, don't buy the argument. Last November, we reported on OMB's initiative to accelerate payments to small businesses from 30 days to 15 days. It was a directive aimed at all executive agencies and aimed at spurring job creation and economic growth. This program has been working fairly well, however it left out a huge subset of small businesses - those who subcontract to large businesses. To address this oversight, OMB issued guidance last week to expand the program from small businesses to all prime contractors. Specifically, the guidance states that "...agencies should, to the full extent permitted by law, temporarily accelerate payments to all prime contractors, in order to allow them to provide prompt payments to small business subcontractors. insert a similar clause in their future contracts with small business subcontractors. If you're a small business subcontractor, you should talk to your primes to ensure you receive expedited payments. This program is good for one year. We're going to finish up our current discussion on internal controls by associating some "internal control activities" to the "internal control objectives" we discussed previously. Yesterday, we listed eight internal control objectives that the Government believes will satisfy just one of the 18 attributes of an adequate accounting system; a sound environment, framework, and organizational structure. Not all of these will be applicable to all contractors. Small businesses are not likely to have audit committees, for examples. Some contractors will devise other objectives, just as good or better than these. We suggest however, at a minimum, that contractors at least consider these. Once contractors have established their internal control objectives for a given area, they need to devise internal control activities upon which to satisfy those objectives. Each objective needs one or more activity. Here again, DCAA has provided examples of activities that might satisfy each objective. Lets take the first objective we highlighted yesterday; integrity and ethical values. Management must convey the message that integrity and ethical values cannot be compromised, and employees must receive and understand that message through continuous demonstration of words, actions and commitment to high ethical standards. expected standards of ethical and moral behavior including dealings with customers, suppliers, employees and other parties. Management places emphasis on establishing and maintaining an effective system of internal controls and self-governance and does not condone signs of inappropriate practices. The second bullet point is important. It constitutes what the COSO (Committee of Sponsoring Organizations) guidance terms "setting the tone at the top". Management does indeed set the tone for the entire organization. Winking at indiscretions would not be setting the proper tone. Taking corrective actions including disciplinary action when necessary, would be setting the proper tone. Ultimately, it is up to contractor to ensure adequate systems of internal controls for their unique situation. The DCAA guidance can be very useful in jump starting the program. Today's post is a bit on the technical side. The purpose here is to walk through the process of identifying internal controls that are important to Government contracting and to show how the Government determines whether controls, as implements, are effective. We will start with one of the DFARS (DoD FAR Supplement) business systems; accounting. DFARS 252.242-7006 states that contractors must establish and maintain an acceptable accounting system that provides reasonable assurance that applicable laws and regulations are complied with, that produces reliable cost data, minimizes the risk of misallocations and mischarges, and consistent with the billing system. On the surface, that might seem fairly straight-forward - just buy a $200 QuickBooks package and you're off. Well its a little more complicated than that because this DFARS clause then goes on to list 18 attributes that the accounting system must provide for. The first of these 18 criteria is "The Contractor's accounting system shall provide for a sound internal control environment, accounting framework, and organizational structure." Now it gets a little confusing and note the subjective word "sound". How is a contractor supposed to figure out what this means and how can it satisfy such a fuzzy requirement? Integrity and ethical values: management must convey the message that integrity and ethical values cannot be compromised, and employees must receive and understand that message through continuous demonstration of words, actions and commitment to high ethical standards. External auditor's report: management should take timely corrective action on any deficiencies noted by the external auditor. Board of directors/audit committee: the board and audit committee should be sufficiently independent enough from management to constructively challenge management's decisions and act effectively on external audit communications and recommendations. Assignment of authority and responsibility: management ensures that appropriate responsibility and delegation of authority is assigned to deal with goals and objectives, operating functions, regulatory requirements, information systems and authorization for changes. The delegation of authority ensures a basis for accountability and control and sets forth individual respective roles. Financial capability: management must ensure that the contractor has adequate financial resources to perform on Government contracts. Accounting system and controls: the accounting system is well-designed and is operating effectively to provide reliable accounting data and prevent misstatements that would otherwise occur. Cost allocations: management ensures that an item of cost or a group of items of cost are assigned to one or more cost objectives in accordance with rules, regulations, and standards for proper distribution of direct cost and allocation of indirect costs. Management ensures the proper allocation of both the direct assignment of cost and the reassignment of a share from an indirect cost pool. Now that you see what's important, you can begin to devise "control activities" to help ensure these "control objectives" are carried out. DCAA provides some ideas here as well. We'll look at a couple of those tomorrow. The sponsoring organizations include the AICPA, the American Accounting Association, Financial Executives International, The Institute of Internal Auditors, and the Institute of Management Accountants. DCAA considers the COSO guidance to be authorative and has relied upon it for establishing guidance for performing audits of internal control systems that are pertinent to Government contracting (See CAM Chapter 5). Funny things happen however between the audit guidance and the actual application of audit procedures. Although COSO and CAM clearly state that internal controls must be tailored for each individual contractor/company, and considering size, organizational characteristics, the nature of the business, complexity of operations, applicable regulatory requirements, etc., we could share many examples where auditors have disregarded the contractor's assessment of its own control environment and corresponding control activities and have used published "control activity examples" as a checklist - "you don't do this, you fail" mentality. Its easy to know what internal control systems are important to DCAA. The Agency's Contract Audit Manual as well as published audit programs and internal control matrices identify those areas considered most important to the Government contracting environment. These include accounting system, estimating system, billing system, labor system, and six others. DCAA is in the process of realigning its coverage so that it ties in closer with the new DoD Business System rules but the core elements will still be there. Tomorrow, we will look at some of the specific internal controls related to accounting systems. 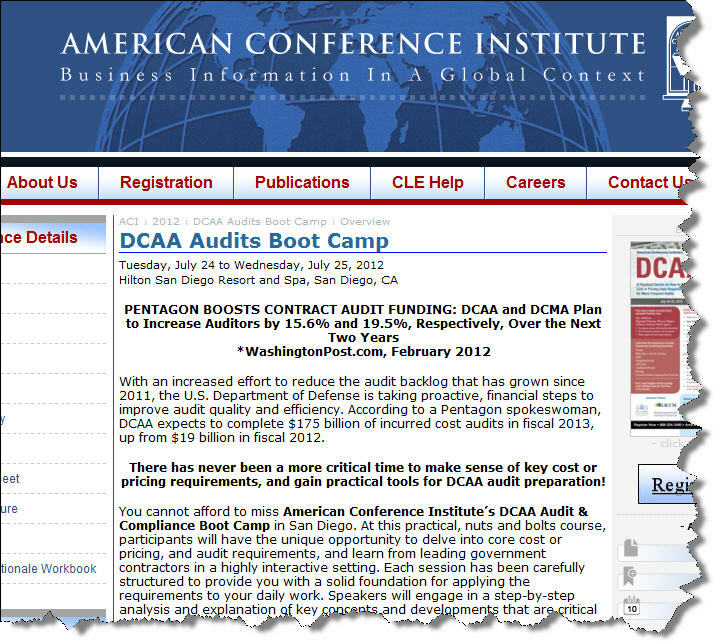 Paul Cederwall of our staff will be presenting in two of the sessions at the DCAA Audit Boot Camp in San Diego on July 23-25 sponsored by American Conference Institute. Click here for more information, the full agenda, and listing of all the speakers. It is important to remember that contractors must have effective systems of internal controls and that management is solely responsible for establishing and maintaining adequate internal controls. Some contractors have a notion that the Government will come along some day and tell them what internal controls they should implement. Some managers believe that by keeping their fingers on the pulse, they do not need internal controls. Others, sadly, do not want strong systems of internal controls because they fear that it would encumber their management style and prerogatives. Internal controls are important and necessary, never more so than in the Government contracting environment. Internal controls provide reasonable (not absolute) assurance that financial reporting is reliable, that operations are running effectively and efficiently, and that applicable laws and regulations are being complied with. Control environment - this is the foundation to all other components. The board or senior management establish the "tone from the top" regarding the importance of internal control and expected standards of conduct. It provides discipline, process, and structure. Risk assessment - this involves a dynamic and iterative process for identifying and analyzing risks to achieving the entity's objectives, forming a basis for determining how risks should be managed. Control activities - these are the actions established by policies and procedures to help ensure that management's directives to mitigate risks to the achievement of objectives are carried out. Control activities are performed at all levels of the entity and at various stages within business processes. Information and communication - necessary for the entity to carry out internal control responsibilities in support of achievement of its objectives. Communication occurs both internally and externally and provides the organization with the information needed to carry out day-to-day internal control activities.. Communication enables all personnel to understand internal control responsibilities and their importance to the achievement of objectives. Monitoring - used to ascertain whether each of the five components of internal control are present and functioning. Findings are evaluated and deficiencies are communicated in a timely manner, with serious matters reported to senior management and to the board. When it comes to establishing effective internal control systems, one size does not fit all. Internal controls must be considered in the context of company size, organizational characteristics, the nature of the business (e.g. type of contracts), complexity of operations, applicable regulatory requirements, and more. Sometimes it seems that contract auditors want more controls than what contractors deem necessary. Sometimes they're right, sometimes not. Tomorrow we will look at the guidance that auditors follow in assessing whether select internal control systems are adequate. Ever wonder where the Federal procurement dollar goes? Here are some stats we came across recently. In fiscal year 2011, procurement spending totaled $535 billion (down by about one percent from fiscal year 2010). Of that amount, DoD accounted for 70 percent or $375 billion. The top 100 Government contractors received 54 percent of total procurement dollars ($284 billion) with ten percent of the contract actions. The remaining 46 percent of procurement dollars were spread among the other 90 percent of contract actions (or, contract awards). The top five Government contractors (Lockheed, Boeing, Northrup Grumman, General Dynamics, and Raytheon) received 19 percent of the total ($102 billion). Thirty-four companies received awards of $2 billion or more. Seventy-one companies received awards of $1 billion or more. Over half of the procurement dollars awarded by DoD were based on competition. While the public seems to be focused on procurement spending, grant spending was higher than procurement spending in fiscal year 2011. Grant spending totaled $545 billion compared to $535 billion for procurement. About 50 percent of these grant dollars were sponsored by DHHS (Department of Health and Human Services) for medical assistance programs. DoD sponsored only eight percent of the total grant spending. Eighty-eight percent of total grant dollars went to state and local governments, 7 percent went to universities and 3 percent to nonprofits. We have written frequently about accounting system adequacy. This is one area where, if a prospective contractor's accounting system is deemed inadequate, there is a good chance that the firm will not get the contract it is seeking. For purposes of determining accounting system adequacy, the Government only requires that a prospective contractor has developed an adequate accounting system. There is no requirement that the system be implemented until there is a successful contract award. There is definitely a cost associated with setting up an accounting system that is adequate for Government contracting purposes. Some of the required attributes are unnecessary in a purely commercial enterprise. Sometimes companies that do not have Government contracts but are seeking to enter that market, do not want to undergo the time and expenses associated with creating such a system, especially when certain required features are not necessary for their other (commercial) work, and there is no certainty that they will be awarded a Government contract. They might not want to, but they need to do it anyway if they want to stay in the running. The Government though, is somewhat flexible in these situations. The Government's position is that a prospective contractor must have developed an accounting system that is operable, though not necessarily in use. The contractor must be in a position to demonstrate this new system to the Government and be ready to implement the system prior to incurring any costs on Government contracts. Here the Government distinguishes development activities from implementation. It says that contractors must develop a system but they don't necessarily have to implement it until contract award. From our perspective, we cannot think of a situation where a prospective contractor would go through the work necessary to develop an "adequate" accounting system and then not deploy it. By the time the system is developed, the costs are sunk costs and the incremental costs associated with implementing would be minimal. Companies interested in pursuing Government work should measure their accounting system against the minimum accounting system attributes listed in SF Form 1408. Thanks to a reader for pointing out that DCAA (Defense Contract Audit Agency) has finally updated its Information for Contractors pamphlet after seven and a half years. This is a very useful guide, especially for newer contractors (in fact, this guide was at one time titled "Information for New Contractors"). The previous version (January 2005) was woefully outdated and needed a refresh. This generic guide represents DCAA's "view" of how things should happen in Government contracting. Sometimes practice and theory diverge. Nevertheless, Government contractors and prospective Government contractors will find a wealth of information in it and we believe it is a good addition to contractor' libraries. Yesterday we wrote about SAIC's appeal of the award of a contract to Lockheed on the basis that the Government's cost-reasonableness analysis was inadequate. SAIC lost the appeal. There was another aspect to this case that we found interesting, especially in light of two recent ASBCA decisions regarding employee compensation (see J.F. Taylor and Metron). To evaluate the realism of these subcontractor rates, the agency with respect to [REDACTED], reviewed USA jobs.gov for comparable labor rates and found that for two of the three proposed categories the rates were the same; for [REDACTED] , the agency compared the quoted labor rates to the federal government’s General Schedule (GS) rates, and found that the rates were realistic for the Millington, Tennessee area where the contract will be performed; and for [REDACTED] , the contracting officer reviewed information at salary.com for similar labor categories to be performed in Millington. (For the fourth subcontractor, [REDACTED], the Defense Contract Management Agency reported that it took no exception to the proposed rates based on information from DCAA and various salary websites.) The agency determined that the subcontractors’ rates were realistic. So you see, the Navy determined that Lockheed's proposed labor rates were reasonable based on information pulled off the internet. Do not use free internet surveys. They are not considered independent or objective. If a contractor uses free internet surveys to support proposed or incurred compensation costs, request assistance from the field or regional compensation technical specialist to perform an independent market analysis. Just because a solicitation requires that successful bidders give hiring preference to incumbent employees, doesn't mean that the successful bidder has to pay those employees what they are currently earning. A recent GAO decision involving a Navy SeaPort-Enhanced multiple award contract (SeaPort-E) illustrates this point. The Navy awarded a contract to Lockheed for information technology services and systems support for the Navy Personnel Command. SAIC, the incumbent on this contract (and losing bidder), argued that the Navy had not performed an adequate cost realism analysis because Lockheed had proposed labor rates for some labor categories that were lower than what SAIC was currently paying. FAR requires that the Government perform cost-realism analyses on proposals for cost-type contracts. From the Government's standpoint, there is a high degree of risk in those types of contracts. Regardless of the costs proposed, the Government is bound to pay the contractor its actual and allowable costs. Cost realism analyses will help the Government determine the extent to which offerers' proposed costs represent what the contract should cost, assuming reasonable economy and efficiency. In this case, SAIC assumed that a reasonable cost realism analysis must be based on a comparison of proposed rates to what the incumbent employees are currently earning, such that any proposed rates that are less than the incumbent employees' current wage rates were unrealistic. The GAO found this argument lacking. Current wage rates are not necessarily current market rates and SAIC provided no evidence to show that Lockheed's proposed rates were less than current market rates. Additionally, the GAO found no basis to conclude that Lockheed would be unable to hire qualified personnel for the contract, including some of the incumbent personnel.